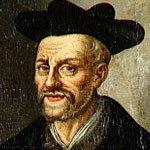 Rabelais was the first French writer I read in old French, and it gave you the same feeling as watching speed chess being played in the underground cafés at six in the morning after a night out swilling plonk in the Left Bank. Rabelais led to Villon, and they both led to the troubadours and the low Latin vulgar poets and that brought you somehow to the mystical latin saved by Rémy de Gourmont, and the endless questions and enigmas posed by pilgrims and vagabonds appearing in these lost texts. I took to Rabelais right away because he loved drink and good food, because the monks wanted to kill him, because he was doctor and lawyer and vagabond, and pissed on the hypocrites and the sophists, but most of all because he took on the academy at risk of his life. But more than that, he could string a good tale together, and he made me realize that I had no interest whatsoever in the tamed beast known as literature, but only in finding more men, dead or alive, who could spin yarns and take the piss out of the true believers and the pedants and drink and eat to the wee hours. Even his birthdate is controversial, although there is some record of cattle being slaughtered as he unceremoniously fell out of his mother’s womb, which would make it Mardi Gras, in the year 1494. Il ne continet mal ne infection. Mieulx est de risque de larmes escripre.